Mondaine is taking its hybrid smartwatch game seriously, as it unveiled the Helvetica Regular Smartwatch at Baselworld 2018. With a two-year battery life and a tonne of extra smarts, the company has come a long way since the original Helvetica 1 Smartwatch was launched back in 2015. Mondaine has teamed back up with MMT to handle the smart stuff on the Helvetica Regular, courtesy of its 281 connected movement. The Swiss X Silicon Valley company is the smart brains behind the Frederique Constant Horological Smartwatch and Alpina AlpinerX. The new Helvetica Smartwatch feeds into the same app for fitness tracking, sleep monitoring, and now, notifications. But while on the app side things are the same, the Helvetica Smartwatch itself has evolved dramatically. While the first-gen was based around the Helvetica Bold font family, this edition plays to the Regular – and that's not just marketing guff. The all-new Regular Smartwatch is a lot less in-your-face than its predecessor and it's been dramatically slimmed down. Eternally more interested in hyperbole and emotion than actual facts, Mondaine didn't know by what margin, but the new watch is 40mm, compared to the 44mm of the original. In watches 4mm makes a huge difference, and this new model is noticeably less bulky. It's also slimmer and lighter, making it much more comfortable to wear, and dare we say it, unisex. You'll get two years between changing the battery, which is the same as before, but the Helvetica Regular is now 3ATM water resistant, so you can take it into the shower and even the pool. That means you can get credit for workouts – although there's no swimming mode per se. But aside from the build it's the smarts which have got a massive overhaul as well. It still tracks steps, with a goal set within the MMT app and progress represented as a percentage on the inner dial on the watch face. Incidentally, that's grown in size, from the small inset dial, and now shares the watch hands to relay the data. And that's the biggest change on this new generation Mondaine. The watch hands are now much more contextual than before. The dial now contains the letters T, M, S and A, mixed among the numbers. Have Mondaine gone mad, you ask? Far from it. "T" refers to telephone calls, and if you miss a call on your smartphone, the hour hand will rotate to the T position to indicate you've had a call. Pressing the crown will dismiss the notification. It will also notify you to incoming calls as well, which is handy if your smartphone is tucked in a jacket pocket, bag or on the table. "M" refers to messaging – and if you get a notification the minute hand will point to this instead. Within the MMT app you can choose which messaging services are included, which is actually a neat way to cut through noise. All the major apps appear to be included from Mondaine screenshots we've seen, with Facebook, Whataapp and Instagram listed alongside email and SMS messages. "S" covers sleep, and the Helvetica Regular will track your slumber, using the accelerometer sensors inside, like any basic fitness band. The main downside is that you have to enter sleep mode manually by holding the crown for three seconds – however unlike other MMT hybrids, the hand will now point to S, showing you're in sleep mode. The hour hand will then use the inner dial to show your sleep goal progress. "A" is the sign for activity. If you want to check how well you're progressing towards your goal just press once on the crown. The hour hand will then point to A and the minute hand will show your goal progress. It's a novel approach which mirrors that of Fossil over the past couple of years, and it's refreshing to see that Mondaine isn't content in just playing off its brand when it comes to smartwatches. Now forgive us if this all sounds familiar – we actually wrote about this and all the functionality back at Baselworld 2017, although the watch was no-where to be seen – and hasn't been spoken about since. 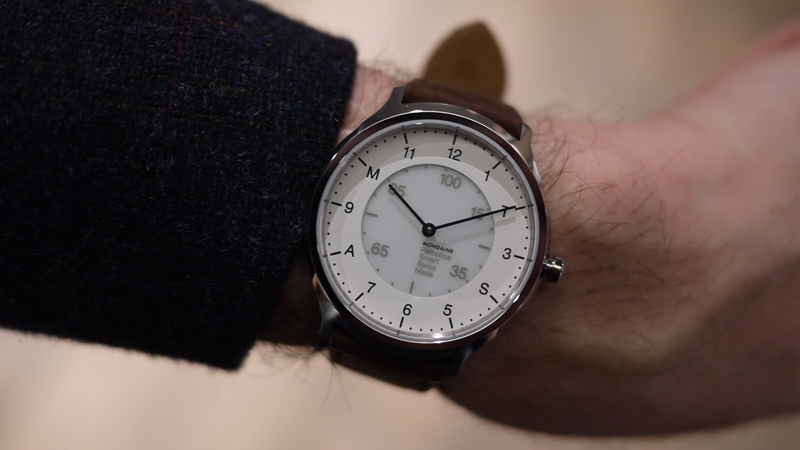 But the good news is that the Mondaine Helvetica Regular will be available in March 2018 – and costs a reasonable £450.